The nose has new oak furniture, pistachios, almonds, peanut brittle, vanilla, and a hint of pink grapefruit. The mouthfeel is thin with no cling, The body has pink grapefruit, vanilla, oak furniture, peanut brittle and a little bit of ginger. The finish has ginger, vanilla and a hint of dark chocolate. Water brings out thin, rapidly expanding whorling that doesn't mottle. The nose gains more grapefruit and loses the almonds and pistachios. The body gains more ginger and loses the peanut brittle. The finish gains more ginger. 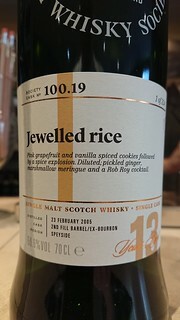 An interesting dram which is well constructed but has a little too much ginger for me. One for a hipflask on spring days.